These free English paper piecing patterns are perfect for beginners who are first learning how to English paper piece. Using basic English paper piecing (EPP) techniques, you can create a variety of projects to show off your new skills. These patterns all incorporate EPP by using hexagons, pentagons, or other shapes to add a lot of interest to your final design. There are patterns for pin cushions, tote bags, coasters, mug rugs, and even full-sized quilts that are great for the beginner. A lot of the free English paper piecing patterns include the templates you need for each project, but there are plenty of free hexagon templates available if needed. Simply print and cut them out to use. Use these instructions for learning how to English paper piece to create some fantastic free projects. 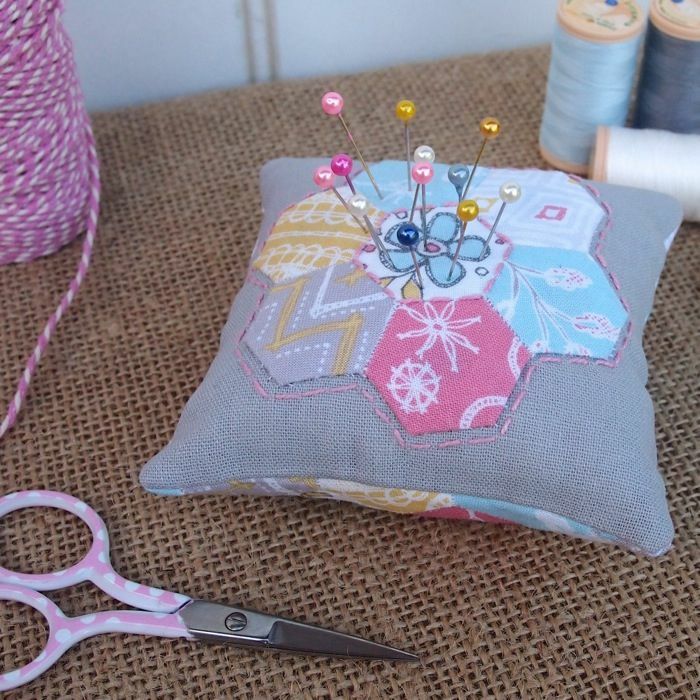 This mini hexagon pin cushion is a great beginner English paper piecing pattern that's simple enough to be your first project. This is a scrap buster project too, and there are even tips on how to change the size of the cushion if you'd like. This coaster is a great beginning English paper piecing pattern because it just uses 7 hexagons sewn together as a flower. Back it with felt and you have a quick project that will make a great coaster, mug rug, or pot holder. Here's another free EPP pattern where you just need to use seven hexagons to make your flower. After creating, put it on top an easy-to-sew heat pack. The instructions cover how to sew, fill, and use the heat pack. Molly and Mama have some great free English paper piecing tutorials that include a hexagon mug rug pattern, simple hexie keyring tutorial, coin purse, and Christmas ornament. All of these projects are perfect for the beginner. Here's a free pot holder pattern that kicks it up a notch by adding a simple 6 hexie flower arrangement to the top. These pot holders are sewing right-side together so there's no binding needed. These are great scrap busters and also make great gifts for the holidays. You'll just need to make six hexagons for this free English paper piecing pattern. After you appliquéd them on, stitch and attach them to the binding to make this modern mug rug. Don't be afraid to change up the colors to really make it your own. Create 19 hexagons from a fat quarter or use your scraps to create this stunning clock. Sew them together as directed and then install a clock mechanism to finish. This piece would look great in your sewing studio or anywhere else in your house. With just 12 pentagons you can create this English paper piecing fabric bowl. It may look difficult, but it's an easy project that requires two layers of pentagons and keeps the paper templates in for stability. These are so cute, you'll want to put them everywhere. Twelve pentagons are used to create one of these precious patchwork balls, perfect for a baby. The paper templates are left inside the hexagons and then stuffing and an optional raddle are put in before sewing it up. You'll need to make quite a few hexagons for this English paper piecing project, but they come together pretty fast to make this patchwork laptop case. Be sure to measure your laptop and adjust the size so it will fit yours. This stunning rainbow hexagon mini quilt is a great way to show off your new EPP skills. There are seven hexagons of each color used to create a lovely rainbow effect. A white background and striped binding really make it special. This free English paper piecing creates a 15" x 15" pillow cover completely made out of hexagons. You can choose your own colors and layouts if you'd like to get a different look. It's a more time-consuming project, but still uses just the simple basics of EPP to create. Take your English paper piecing hexagons and turn them into something usable with this zipper pouch pattern. This free pattern includes a download of all the instructions and templates, as well as an instructional video. 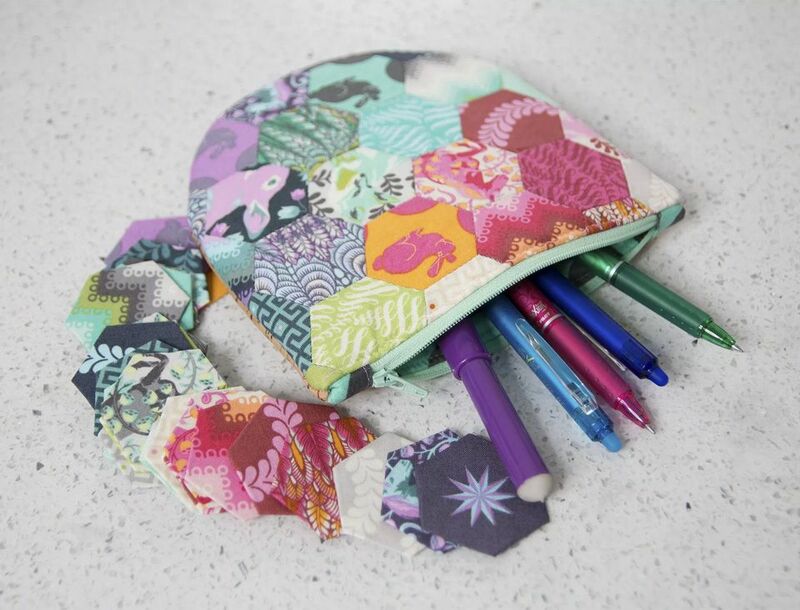 Use your English paper piecing skills to create this travel kit so you can take your hand sewing on the road. This is an intermediate sewing project because the assembly is a little advanced, but it only requires basic EPP techniques. You'll need to make quite a few hexagons to make this English paper pieced tote bag, but the construction is straight-forward and great for a beginner. Quilting is added to the outside of the bag to add extra texture to those hexies. Put your skills to the test with this free English paper piecing quilt pattern. A whopping 260 hexagons are sewn together to make this 65" x 70" quilt that would look great in your home or make a wonderful gift to a very lucky recipient.